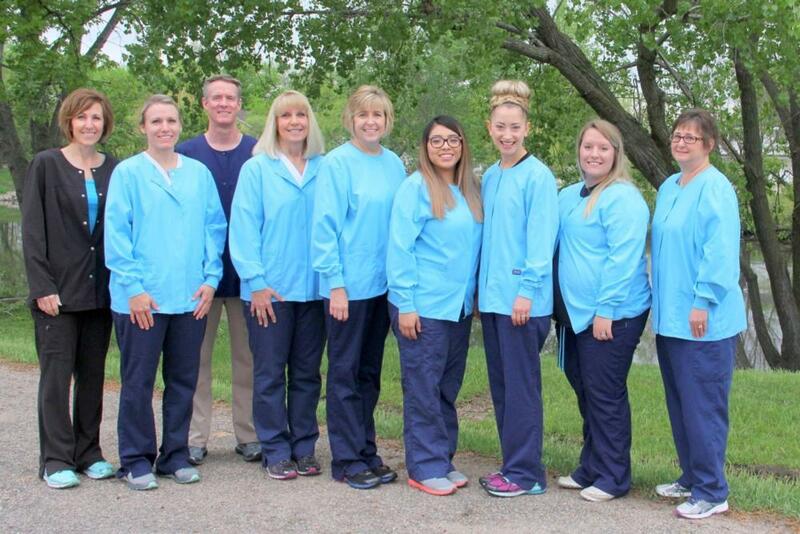 Waters Family Dentistry is excited for you to meet our team! They are a wonderful group of professionals who work together to serve our patients. Our team takes pride in the individualized care our practice offers to our patients. We are grateful for the hundreds of positive online reviews we have received. Every day we remind ourselves to over-deliver to our patients by adding value to their visit. At regular continuing education courses, our staff is challenged to develop both our professional and interpersonal skills. We often travel as a team to attend conferences to stay up-to-date on the latest in dentistry. Through regular staff meetings and training opportunities, we strive to educate and elevate our dental team. Each of our team members is CPR certified, and we conduct annual trainings for HIPAA (Health Information Privacy) and OSHA (Occupational Safety and Hazard Administration). When not at the office, our staff members are very involved with their families and in their community. They serve others with their time and talents in schools, churches, and community groups. We often participate together as a staff in volunteer and community activities. Dr. Waters is a native Nebraskan, born and raised in O’Neill. He attended the University of Nebraska at Lincoln for his pre-dental studies and was accepted to the University of Nebraska Medical Center College of Dentistry after three years of college. While at the College of Dentistry, Dr. Waters completed several rotations including pediatrics and rural practice. He graduated and completed his dental board exams in May 1989. In June 1989, he began his dental practice in Grand Island. Dr. Waters is an active member of the Hall County Dental Association, Nebraska Dental Association, and American Dental Association. He is a member of the Spear Study Club which focuses on improving clinical expertise and practice growth. Dr. Waters has served on the Hall County Board of Health and as a volunteer at Mission of Mercy. His special interests in dentistry include implants, restorative, crown and bridge, esthetics, and children’s dentistry. While not at the office, Dr. Waters enjoys biking and relaxing with family. He and his wife have two children, Alec and Lizzie. He is an avid Husker football fan and has developed a love for reading in recent years and is frequently adding book titles to his "to read" list. Cara was raised not far from Grand Island in Giltner, Nebraska. She started her career in the dental field as a dental assistant, receiving her associate degree in dental assisting from Southeast Community College. After a few years, Cara continued her dental education and received her associate degree in dental hygiene from Central Community College in Hastings. She has been caring for dental patients for more than ten years. Developing one on one relationships with her patients is something Cara greatly enjoys about her role at Waters Family Dentistry. She also seeks to educate her patients on their oral health status and receives satisfaction when their conditions improve. Cara and her husband are parents to three beautiful, active children. They enjoy camping and spending time at the lake with their extended family and friends. She enjoys staying active by walking and biking. Cyndi is a Grand Island native. She has worked in the medical field for over ten years and has been with Waters Family Dentistry for more than eight years. Cyndi began as our Relationship Coordinator and transitioned into the Patient Services Role in 2013. She appreciates the opportunity to have conversations with all the patients she interacts with each day. When you have an appointment at Waters Family Dentistry, you may have the pleasure of talking to Cyndi as you check out at the end of your visit. Cyndi and her husband love to travel and spend time with their grandchildren. One of her passions is helping the victims of human trafficking. She and her husband have partnered with another couple to create the STOP foundation (Stop Trafficking on the Plains). This foundation provides for the needs of rescued victims. Denise is originally from Hastings, Nebraska but has lived in Grand Island since 1989. She attended Central Community College in Hastings and received her Applied Science Degree in Dental Assisting. She is certified in coronal polishing and dental radiography and has served the needs of dental patients for more than 25 years. Denise appreciates all the positive changes she has seen in the field of dentistry. She enjoys working with patients, and you may meet Denise during a new patient appointment or when she is assisting Dr. Waters during a restorative procedure. In addition to gardening, Denise likes to read, crochet, and spend time with family. She and her husband Robert have two children Logan and Abby and two lovable dogs. Jayne is from Hayes, KS. She moved to Grand Island for employment, and while adjusting to her location, she met the love of her life and they married in 2014. Now she considers Grand Island her home! She has been caring for the dental health of her patients since she received her Dental Hygiene Degree from Colby Community College in 2012. To Jayne, being a hygienist means she gets to participate one on one with her patients and their oral health. She loves helping them! While not in the office, you may find Jayne teaching fitness classes, running road races, or taking hiking trips with her husband. She also enjoys volunteering with the youth ministry at Third City Christian Church. Natalie was born and raised in Kansas. She attended college in Grand Island at the Spencer School of Business where she received her associate degree in Applied Science. Natalie has worked in the medical field for 17 years and has been in the dental field for more than five years. She has been certified by The Scheduling Institute in providing excellence in phone customer service. Natalie enjoys helping patients in many ways. She is our key person who reviews dental insurance benefits and also manages our hygiene schedule. You may get the pleasure of speaking with Natalie when you call to schedule your next appointment. You will appreciate her efficiency! In her free time, Natalie likes to spend time with family and friends. Summer is her favorite time of year because she likes camping and kayaking. Sadi was born and raised in Grand Island and graduated from Grand Island Senior High. She has been working in the dental field for more than six years and received her certification for dental radiography at UNMC College of Dentistry. You may meet Sadi at your new patient appointment or when she is assisting Dr. Waters during a procedure. She really enjoys meeting new people and interacting with patients in the office. Sadi married her sweetheart Nick last fall, and they are excited to be welcoming their first child in July of 2018. In her free time, she enjoys playing co-ed softball and spending time with family and friends. Yiho was born in Mexico and raised in Grand Island. She graduated from Grand Island Senior High in 2009. Following graduation, Yiho lived in Grand Junction, CO for three years before returning to Grand Island. She has been in the dental field for more than two years and recently became certified by UNMC College of Dentistry to take dental radiographs. At Waters Family Dentistry, Yiho enjoys being apart of a caring, professional team. She is most likely the first smile you will see when you walk in our door. For our Spanish speaking patients, Yiho is invaluable! She appreciates being able to educate patients on how to take care of their teeth and answer their questions in a language they can understand. In her free time, Yiho enjoys photographing family and friends. Two of her best photography subjects are her two beautiful children Paulina and Dayton. She has a pet ferret named Cashes and a dog named Money.